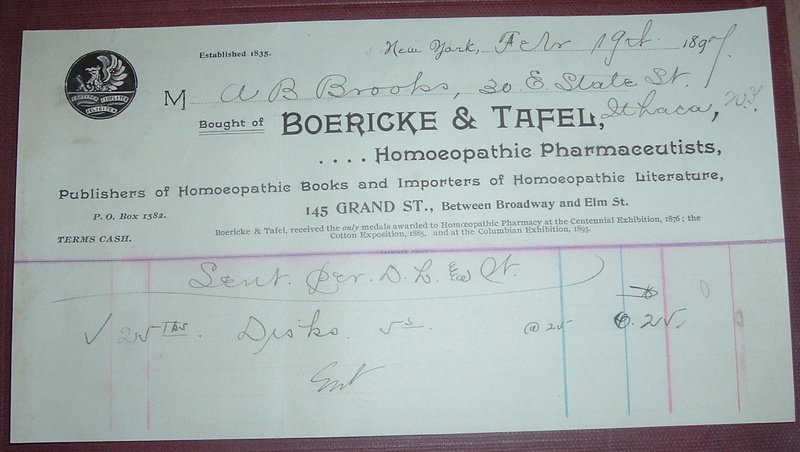 Boericke & Tafel is among the oldest homeopathy companies in the world and a pioneer of homeopathy in America. The company got started in 1853 with the manufacture and sales of homeopathy products. A decade later, the company was firmly rooted in major cities across the country. They also added publisher and bookseller to their business description. Not only did the company become leading "Homeopathy Pharmaceutists," it also established itself as a leading publisher of homeopathy books. 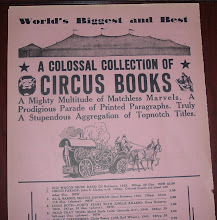 The 1897 billhead above states in smaller print beneath the company name: Publishers of Homeopathic Books and Importers of Homeopathic Literature. I can't offer any information about the literature they imported for their books sales, but their own published books (more than a hundred titles, comprised their catalog) accounted for about eighty-five percent of all homeopathic books published in the United States. 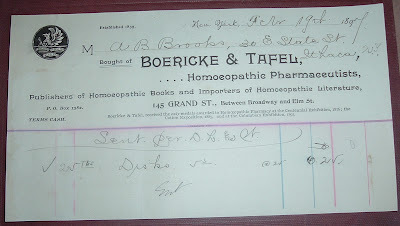 Some of these titles included The American Homeopathic Pharmacopoeia, The Sixth Edition of Hahnemann's Organon of Medicine (translated by William Boericke), and Boericke's Materia Medica with Repertory, which, according to Homeopathe International, "is today the standard U.S. materia medica and an integral part of most homeopathic computer repertorization programs." That bit of Boericke & Tafel company history comes from Sylvain Cazalet, whose articles, history, and images are a great Internet resource on the subject. The company rode a wave of popularity for homeopathy in the 19th century. The 20th century saw a decline in that popularity, but Boericke & Tafel survived and is still kicking in the 21st century as a brand of Schwabe Pharmaceuticals of Germany. Here's a relic from those heady (pun intended) counterculture days of the 1960s-70s when headshops appeared on the scene. 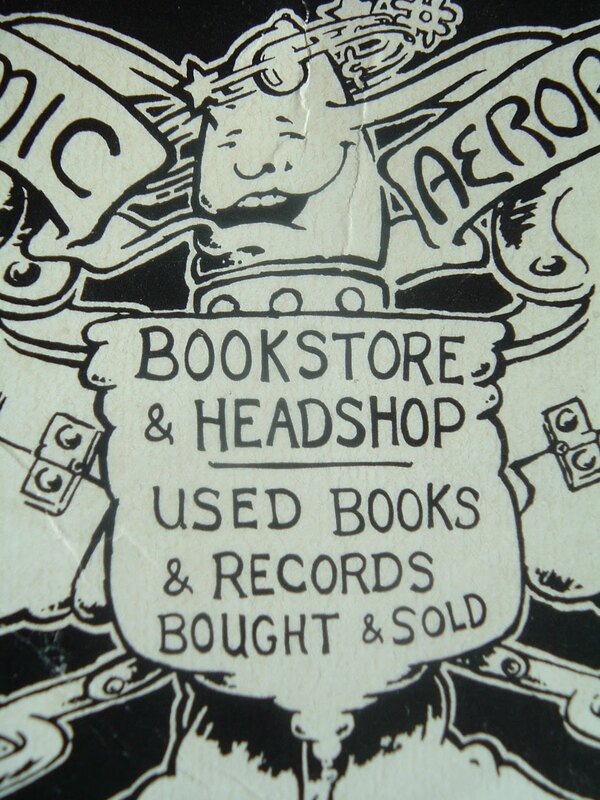 I remember one close to where I grew up that was called a record shop, but it was a headshop, too. 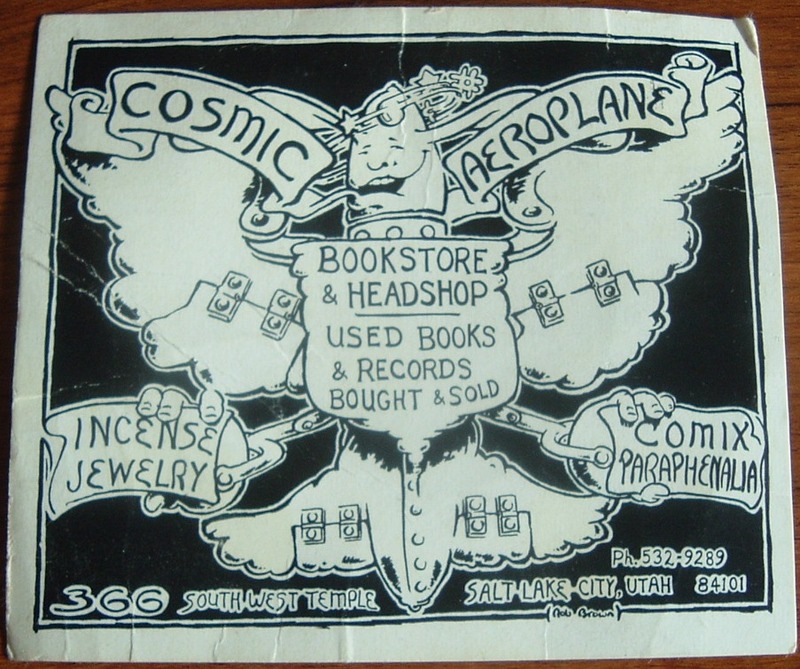 As a teenager circa 1969-1972, my memories of that place were incense, paraphernalia that had nothing to do with music (or perhaps it did in an enhancement kind of way), hippie-looking staff and patrons, and some really cool records. I got introduced to the music of Townes Van Zandt there with his 1972 album, The Late Great Townes Van Zandt. But I digress. 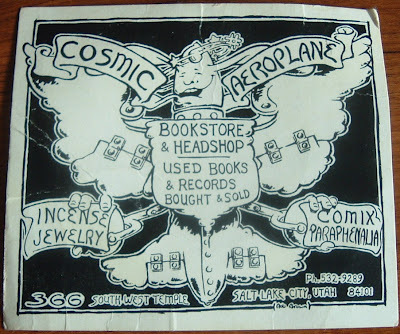 While Jones’ Cosmic Aeroplane was a good place to find out about bands coming Utah and purchase “imported beads and bells from San Francisco,” the shop, originally located on 900 E. and 900 S., provided a rallying point for Utah’s expanding consciousness until its closure in 1991. 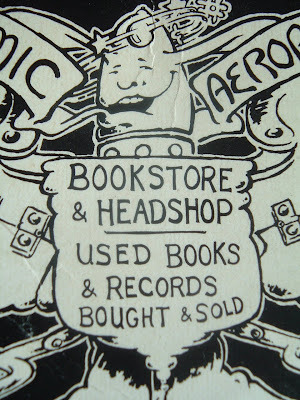 Books, used records, underground comix and dope paraphernalia were available, and with a move to larger digs, the Aeroplane opened an experimental theater in back (the Human Ensemble, then featuring KSL news fixture Shelley Osterloh). The larger space also accommodated a draft counseling center run by Hal Sparck, who had frequent legal wrangles with the Selective Service as a result, but always prevailed. I don't know if books were part of the mix when the place opened, or if they were gradually introduced into the shop's inventory, but in 1977 two new business partners ensured its legacy as a bookstore. Bruce Roberts and rare book dealer Ken Sanders provided an infusion of cash and expertise in books to help the shop blossom into a million-dollar business (at least one year reportedly). This trade card or business card may be from the Roberts-Sanders era, as the address given is 366 South West Temple and the original location, stated in the quoted passage above, was elsewhere. Regardless, its ancestry boasts of vintage 1960s. But nothing lasts forever. By 1991 the Salt Lake City icon of counterculture and subversive literature and music met its demise, reported here in the Deseret News. 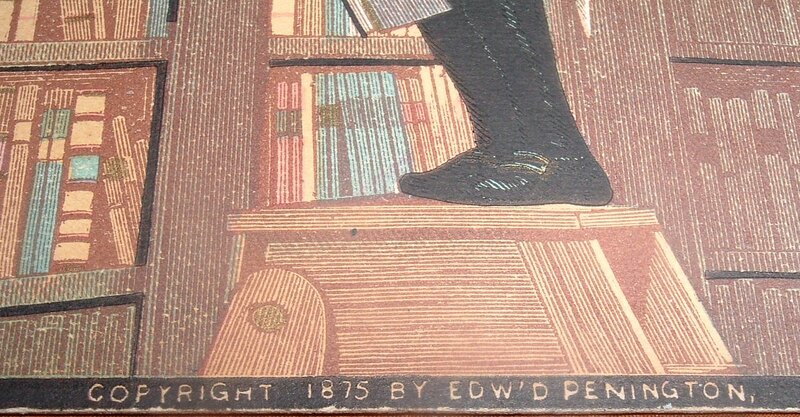 My last post was about a Philadelphia bookseller, John Penington & Son, whose 1875 trade card I had recently acquired. 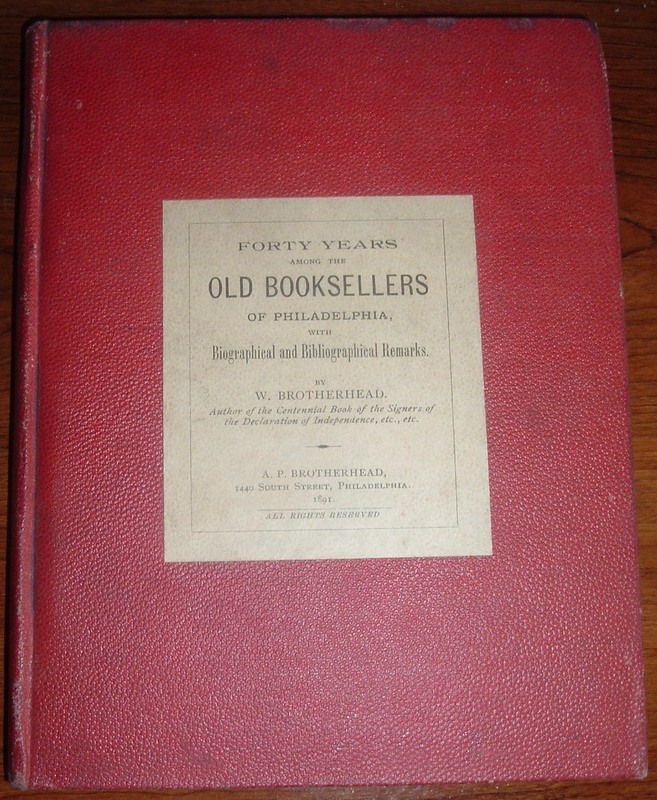 A few months ago, I had purchased a copy of Forty Years Among the Old Booksellers of Philadelphia with Biographical and Bibliographical Remarks, by W. Brotherhead (published by A.P. Brotherhead, Philadelphia, 1891). Affixed to the book's endpapers, I found a couple of paper items I like to feature here occasionally--a bookplate and a bookseller's ticket, or label. Of H.S. Pickering and books or libraries there is nothing to be found through repeated searches. 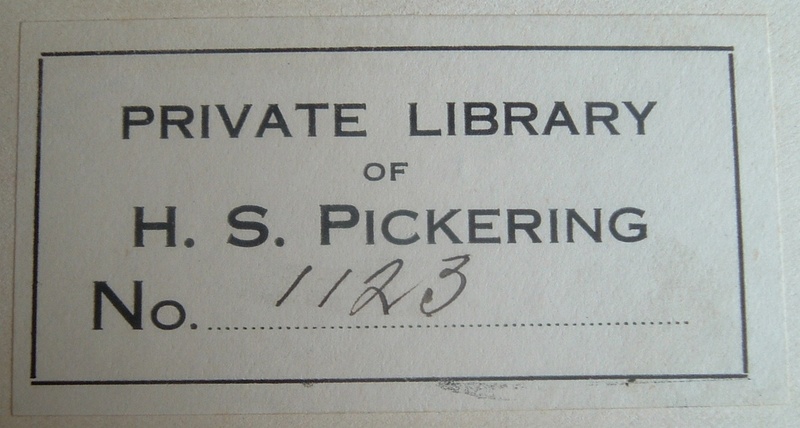 There was a man by that name who wrote a book about covalent something or rather, but I doubt that was my Pickering with the bookplate. 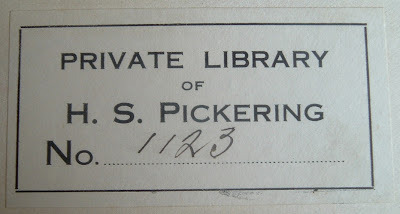 My Pickering would be more appropriate as a relation to the Pickering of the Pickering & Chatto antiquarian booksellers, but I can't find any connection there. If not associated with the bookseller, perhaps he was a committee member for the The English Association, for which there was an H.S. Pickering. Venturing farther away from the book world, maybe this H.S. Pickering was the wealthy Bostonian, Harry Pickering (middle initial unknown), of Harry's Bar fame in Italy (and around the world now). Was Harry a bibliophile who picked up a second-hand copy of Brotherhead's book (he hadn't been born yet when it was published)? That would make for a good story and be of more general interest. For the "H" in H.S. Pickering, I've substituted Henry, Harold, Harry, Horton, on and on through Hubert, Hugh, and Humphrey to no avail. Names turn up, but nothing associated with bookselling or book collecting or libraries. Whomever the elusive H.S. was, he was interested in old Philadelphia booksellers and had a structured library to the point that his books contained a bookplate identifying the book by a number. Additional provenance on this book was found on the rear endpapers in the form of a bookseller ticket or label affixed to the rear pastedown. McGirr's State House Book Shop of Philadelphia once had this book in its possession and sold it somewhere along the line. 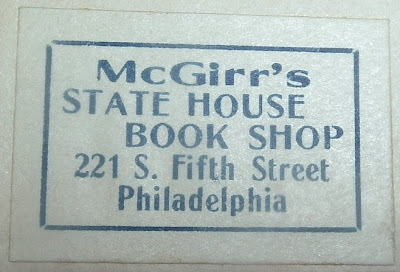 As McGirr's is not listed in Brotherhead's book about booksellers in Philadelphia, I assume that the book shop did not exist prior to 1891. I have found references to around 1917. Beyond that, I know virtually nothing about the book shop's history, but a bit of information on the proprietor follows. McGirr appears to have been, in addition to a bookseller, a writer, editor, and publisher (thus my comparison to fellow Philadelphian Franklin). I can find several references to works of folklore, particularly in Pennsylvania, that he was involved with. And more particularly, he had a special interest in music history of the region. I could also venture a guess that he was somewhat of a songcatcher, a Lomax contemporary, who had at one time his own record label. I did find mention of a book he wrote, which I have to get for my library: Experiences of a Pennsylvanian with Old Books, Bibliophiles and Old Records. I can't find anything more than the title and author (McGirr) and it seems to be long out-of-print and unavailable. 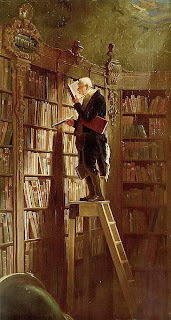 Carl Spitzweg's painting, Der Bücherwurm (The Bookworm), has been used by many booksellers to sell books and by many bibliophiles to decorate a library or reading room. My own library's walls are pretty much obstructed by tall bookcases, but the little wall space left for art includes a framed print of The Bookworm. 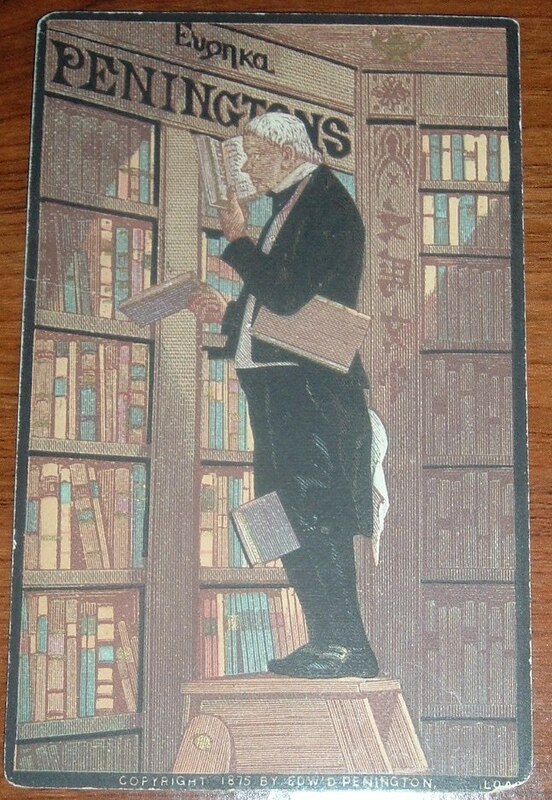 So it came as no surprise to find an image of the famous painting on an old Philadelphia bookseller's trade card. What was somewhat surprising was the copyright date on the card: 1875. I erroneously remembered The Bookworm was painted about that time and found it interesting that it had been adopted so quickly by a bookseller. 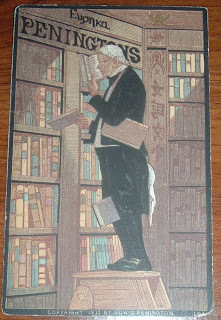 I was off by 25 years, but 1875 may have still been early in the use of this image among bookmen. This is the earliest commercial use of it I have in my ephemera collection, anyway. The most Fastidious Taste of the Erudite and Curious may be gratified in their "Rare, Old Book Shop." 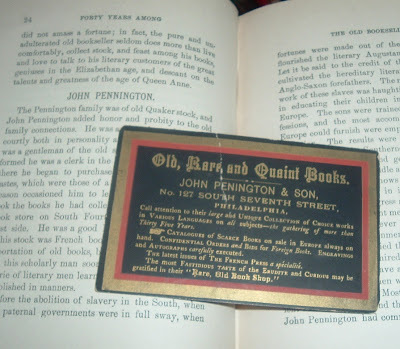 It dawned on me, as I looked at the card, that a recent addition to my library might shed more light on this John Penington and his business history. 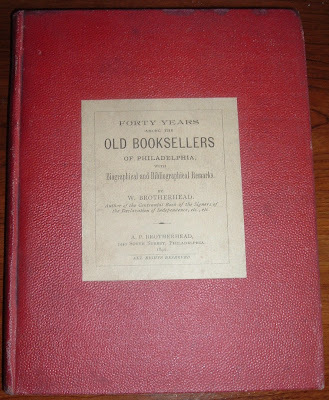 I have a copy now of Forty Years Among the Old Booksellers of Philadelphia with Biographical and Bibliographical Remarks, by W. Brotherhead (published by A.P. Brotherhead, Philadelphia, 1891). Penington is included in this history, but the author spells his name with a double "n." I'm going with the trade card spelling. I have to assume the card was done to Penington's specifications and approved before printing. I have also found some genealogical information to support that (included further down in this post). Brotherhead comments briefly on John Penington's background, describing him of old Quaker stock, well-educated, a French scholar, and a collector of books, with particular taste in the belle lettres class of books. With his own substantial collection, he entered into business as a bookseller, opening his own book shop after a presumably unrewarding stint as a clerk in the Custom House. 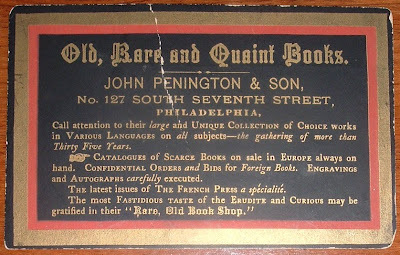 At this point, I think the history behind Penington's book shop gets pretty interesting because of the clientele that called on the Philadelphia bookseller. They were primarily wealthy southerners, slaveholders of the plantation aristocracy. Through his disdain for the history of slavery in America, Brotherhead reveals a thinly veiled opinion of southerners. But he finds a redeeming characteristic in the "literary Augustan age of the South:"
Let it be said to the credit of these men that they cultivated the hereditary literary instincts of their Anglo-Saxon forefathers. The money made from the work of these slaves was haughtily and grandly spent in educating their children in the best schools of Europe. The sons were trained for the various professions, and the most accomplished teacher that Europe could furnish were employed for their higher education. The results were that in proportion to their population, the Southerners produced a class of men, both in numbers and general culture, that far exceeded those in the Middle and Eastern States. The history of the country shows that, up to 1860, when the Rebellion broke out in its greatest Ferocity, the South, in both the Congress and the Senate, shows a greater galaxy of brilliant men than all the rest of the States combined. However censurable and questionable this mode of government may be considered by many, it cannot be denied that it produced a class of men always to be admired by the literary student, that we in the North have as yet to produce. Brotherhead provides this history to establish the background of Penington's chief patrons. This cultivated Southern class always called on Penington, it seems, when on business in the east. Penington seems to have cornered the market on imported books from Europe, which, according to Brotherhead, the Southern literati craved. When the Civil War (Rebellion) commenced, Penington lost a sizable portion of his customers and never recaptured the luster of the pre-War days. John Penington died in 1867, a few years after the war ended and the business passed to his son E. Penington (the copyright name on the trade card). 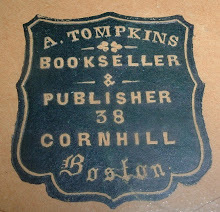 As of Brotherhead's writing, 1891, the business had passed to the son of E. Penington. I can only assume the bookselling firm limped into the 20th century, a shadow of its former venerable-bookseller self. Brotherhead laments the loss of the esteemed business that made Philadelphia the center for imported works of literature during the period 1800-1860. He claims New York booksellers began adopting the importation model for both literature and engravings and "robbed" Philadelphia of the noble reputation it once boasted. I have to wonder how New York managed to recapture the market after the war and Philadelphia didn't. Beyond my limited knowledge of the history of the two cities and the factors involved in their literary development before and after the war, I would think it may have had something to do with the quality of Penington, the bookseller, and the lack of qualified successors in his city. I'll have to read the rest of Brotherhead's history of the old booksellers of Philadelphia to see if any clues turn up there. 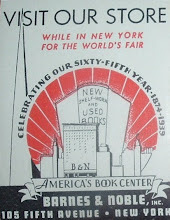 There seems to be something about New York after the war that cultivated more booksellers in the mold of John Penington. Earlier, I alluded to the Penington genealogy. I learned form a Chester County Historical Society document on old families of Philadelphia that the Penington name was once spelled with two "n's," but had dropped one of them along the way. More importantly, I learned that John Penington came by his love of literature and book collecting rightfully. A scholar of fine parts, thorough in his knowledge of bookselling, with judgement and skill, a biographer in its broadest and best sense he was an honor to the craft, and he took pride in it. 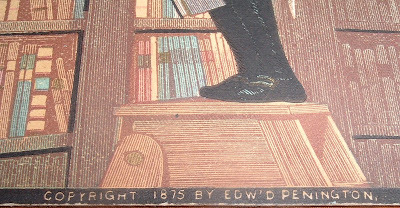 He was a man of fine taste, of large reading, and of exhaustless service to all who were curious in scholarship or earnest in the study of letters... His shop became the gathering place of scholars and men with taste for letters, and one generation after another grew up almost under his eyes in the various branches of literature which he supplied…The trade of bookselling in his hands was elevated to the dignity that it really acquires in the hands of competent men. Such men are rare everywhere. ...the halo of old John Pennington has passed away, and his fine old store and name, except to a few, is sunk into oblivion. 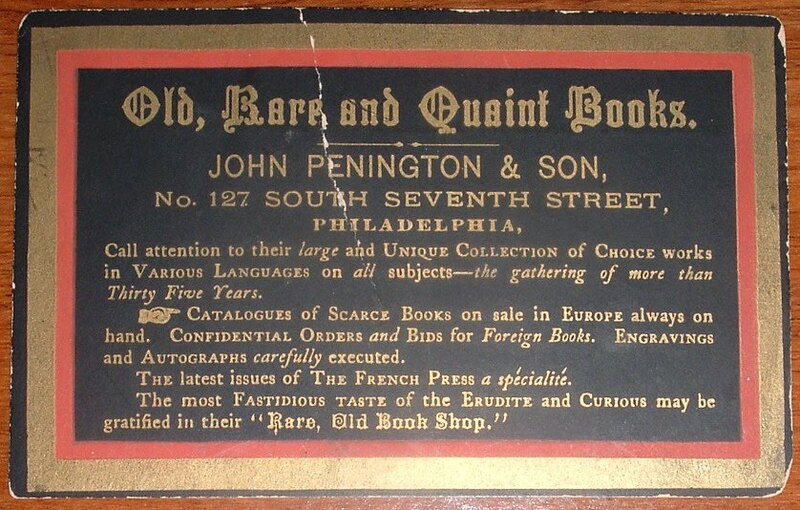 Perhaps the discovery of a 135-year-old trade card for the book shop has raised the memory of John Penington, Bookseller from the depths of oblivion, if only momentarily. 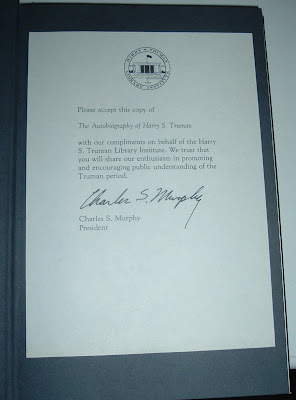 Tucked inside the front cover of a copy of The Autobiography of Harry S. Truman, edited by Robert H. Ferrell (Colorado Associated University Press, 1980), I found a presentation note from the Harry S. Truman Library Institute. 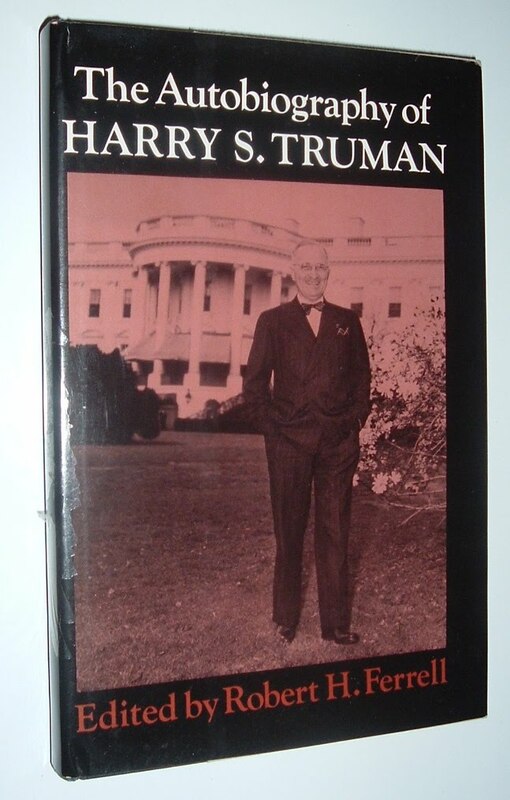 The implicit invitation it contained led me to some of Truman's private thoughts, which reinforced the slogan often associated with him:" "Give 'em Hell, Harry!" 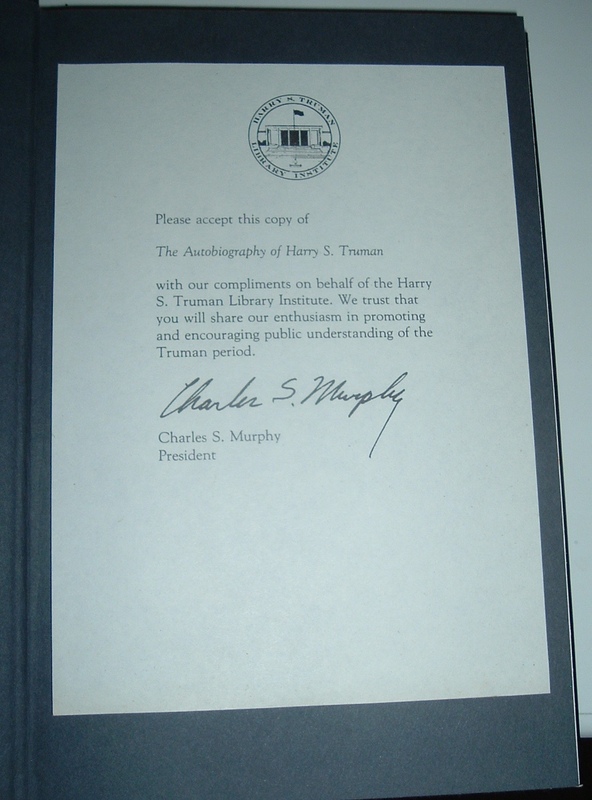 The letter implies the book was a complimentary copy for another library or institute of higher learning and invites the reader to promote and encourage public understanding of the Truman period. 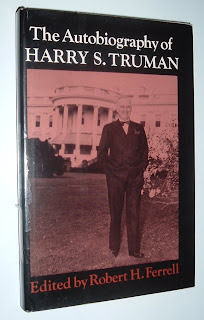 Taking some direction from that typed note, I thought I'd first go poke around in the Harry S. Truman Library Institute. I quickly found it doesn't exist under that name these days. Now, it is properly referred to as the Harry S. Truman Library and Museum. At the Harry S. Truman Library and Museum site, I clicked on the Research link and found under Special Features a link to Truman's 1947 Diary. Old diaries can be interesting to peruse, especially for high profile individuals such as ex-presidents. I got a lot more candor than I bargained for while reading Truman's diary. Below are some excerpts from the diary he kept that year. Mrs. Roosevelt came in at 3 P.M. to assure me that Jimmy & Elliott had nothing against me and intended no disparagement of me in their recent non-edited remarks. Said she was for me. Said she didn't like Byrnes and was sure he was not reporting Elliott correctly. Said Byrnes was always for Byrnes and no one else. I wonder! He's been loyal to me[.] In the Senate he gave me my first small appropriation, which started the Special Committee to investigate the National Defense Program on its way. He'd probably have done me a favor if he'd refused to give it. Maybe there was something on both sides in this situation. It is a pity a great man has to have progeny! Look at Churchill's. Remember Lincoln's and Grant's. Even in collateral branches Washington's wasn't so good-and Teddy Roosevelt's are terrible. Truman makes note of a heart condition in his March 7th entry and scoffs, "So What! "Left Mexico City at 6 A.M. Everyone[,] President, Cabinet, half the City to see me off. Land at Waco in the rain at 11 A.M.
Doc tell's [sic] me I have Cardiac Asthma! Ain[']t that hell. Well it makes no diff[erence,] will go on as before. I've sworn him to secrecy! So What! How we'll miss Mrs. Patterson! as well as the Sec[retary] of War. Looks as if we've lost a grand, honest man & wife of the same caliber and have gained a good man and a baby talking, henna haired lady. She went to school with Claire Booth Luce-too bad I'd say. Cabinet women are a problem. I'll write a book on it some day. There are many more for researchers and historians to debate. 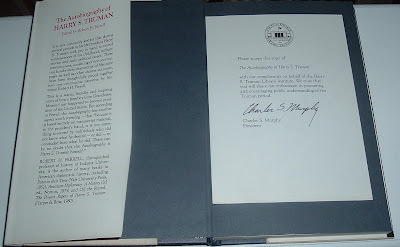 I don't know that I would have ever had any knowledge of Truman's diary and its contents had I not found a letter from his Presidential Library tucked inside his autobiography. More evidence of ephemera's collectibility and importance in discovering history. 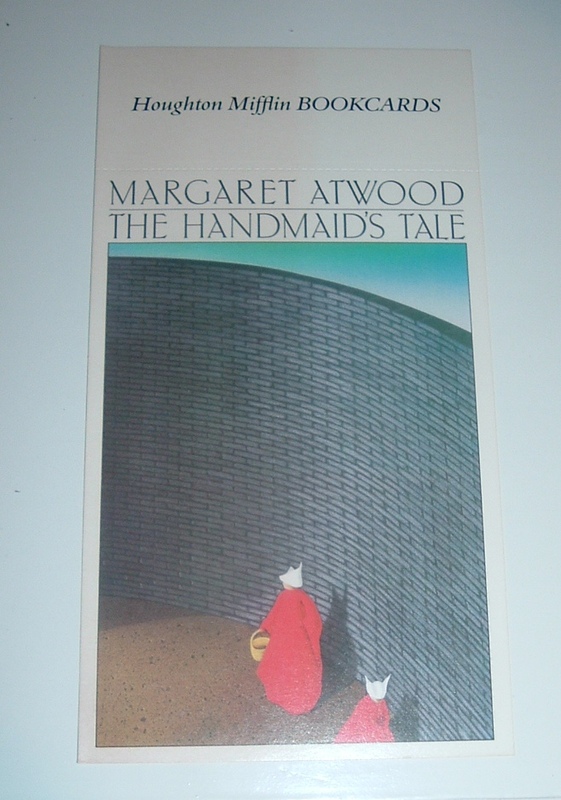 I found this card in a copy of The Handmaid's Tale, by Margaret Atwood (Houghton Mifflin, 1985). You might recall the 1990 film version starring Natasha Richardson, Faye Dunaway, and Robert Duval, among others. 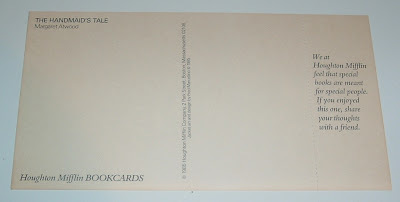 The book's publisher, Houghton Mifflin, labels this insert a bookcard, but it was meant to be used as a postcard. While the front of the bookcard duplicates the jacket art from the book, the reverse side contains a written nudge, in a perforated area, to send this card to a friend if you enjoyed the book. As this is the first one I've run across, I wonder if this were a short-lived promotional campaign for this or a few select books? I also wonder how many were issued and what percentage were actually used? While it's nice to have this piece of ephemera fully intact, I'd also like to come across some used cards with reader comments. I did a little quick research, using Abebooks.com's Advance Search feature, which allows you to narrow your search by publisher and date range, as well as key words. I used them all and also selected 1st Edition and Hardcover, thinking that Houghton Mifflin may have inserted these cards only in their first print run of a book. 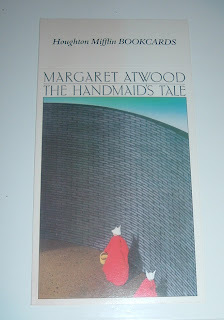 My initial search resulted in just eight books with bookcards included, three of which were The Handmaid's Tale. The remaining five books included one duplicate. The publication dates of these books ranged from 1984-1986. I was about to conclude (reasonably enough) that Houghton Mifflin printed these bookcards only for that time period, but I decided to expand the range to make sure I had covered the actual period these cards were issued. I changed the date range to an exaggerated 1850-2010. Only one more book popped up in the results, a spoof of Gone With the Wind, titled The Wind Done Gone (2001). So now we have a range spanning 1984 to 2001, with most books lumped together from 1984-1986 and one sitting way out at 2001. I'm reasonably sure these promotional bookcards were issued only during the time period I found--1980s through the early 2000s. As with subscription ads inserted into magazines, perhaps many of these bookcards just got trashed after the book was purchased. Think of Rand McNally and you think of maps and road atlases. But they got their start in the 1850s as printers and publishers of newspapers and railroad ephemera such as tickets and timetables. Their company name reflected two individuals, their names separated by a comma, as shown in the billhead above, dated 1900 (New York office). Research into this billhead also revealed how a well-known American publisher adapted to adversity and changing times for more than a century to thrive in an increasingly competitive business environment. 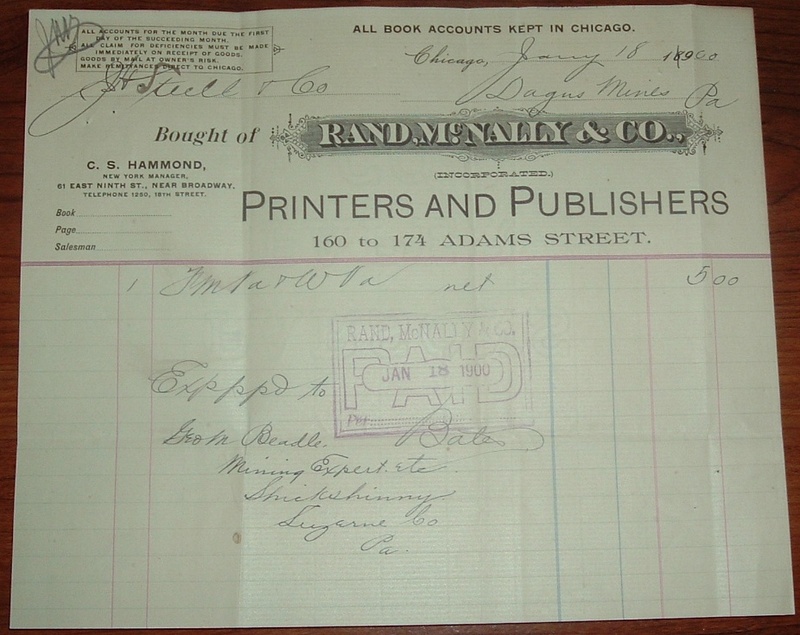 William Rand started a small printing business in Chicago in 1856, offering his job printing services for a variety of items. A few years later, he hired Irish immigrant Andrew McNally to help with his growing business. A Chicago newspaper, forerunner to the Chicago Tribune, hired both in 1859 to run their printing shop. A decade later, the pair had purchased the printing operations from the newspaper and struck out on their own. But the company nearly lost everything in the Great Chicago Fire in 1871. They managed to rescue a couple of ticket printing machines and buried them in the ground several miles away to escape the intense heat. This saved the business and they were able to resume printing within days in a rented space. The next year, 1872, Rand and McNally began turning their printing focus to the booming railroad industry in Chicago, for which they printed their first map in that year. Thus began their association with publishing maps and later educational materials. 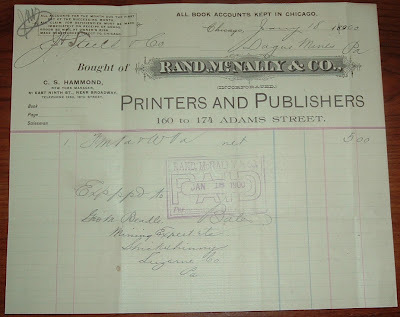 Rand sold his interest in the business in 1899, but the company name remained intact and the McNally family continued running the business for nearly another century until Andrew McNally IV sold the company in 1997. 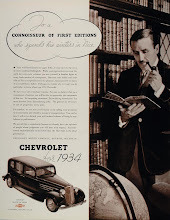 By that time, the company name had become synonymous with maps and road atlases, which they developed along with the country's automobile industry and road travel. From railroad tickets to their first road map in 1904, to atlases, book publishing, travel stores, and software products, it's interesting to see how Rand McNally strove to evolve with the changing times and their customers' needs.